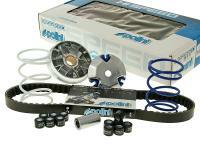 Polini hi-Speed kit now available as a cost-effective set! Hi-Speed stands for better drive and smoother shifting. Supplied as shown with: 2x sets of 16x13 rollers at 5.6g and 4.9g, 1 set of sliders, 2x counterpressure springs, open vario sleeve and a belt.